Here at SparkPost, we create all types of content to help our community succeed: documentation, screencasts, client libraries, sample code, and more. One thing we haven’t done well is: provide an easy way to find this content. Today we are excited to introduce the SparkPost Developer Hub, a centralized location for developer content and information. Our blog posts will cover a wide range of topics from announcements for client library releases and new features to technical posts related to our tooling, technology, and architecture. We believe strongly in sharing our experiences and expertise with the development community, and the blog is a great outlet for doing so. To assist developers with various levels of familiarity with SparkPost we provide detailed API documentation, maintain a support library, and create screencasts and informational videos like our SMTP setup tutorial, our reporting tutorial, and our sending domains tutorial. These videos help you get familiar with the SparkPost API and UI as well as topics that span beyond our interfaces. For those that want to use the SparkPost API through your preferred language or framework, we have client libraries available in Node.js, Python, and PHP, with Java, Ruby, and Go libraries in the works. All our client libraries are open sourced through our Github org, and contributions are welcome. If a library in your language isn’t available, let us know, or create your own and we’ll add it to the list of community libraries. Code samples and snippets provide real-world examples in various formats that show how to use SparkPost. Our integrations allow you to use SparkPost through your favorite service. If you’re using Heroku, check out the SparkPost add-on. Try our Zapier app to trigger emails through SparkPost from various sources. Stay informed on which events we’ll be attending and when by viewing upcoming events on the hub. Come say hello to our team of engineers and advocates – we love to hear from our community. We are constantly looking for new events to attend. If you would like us to attend your event, please let us know! Have an idea or request for content for the SparkPost Developer Hub? That’s great! We want to know what content you need to be successful. The Developer Hub is open source, so feel free to submit an issue. 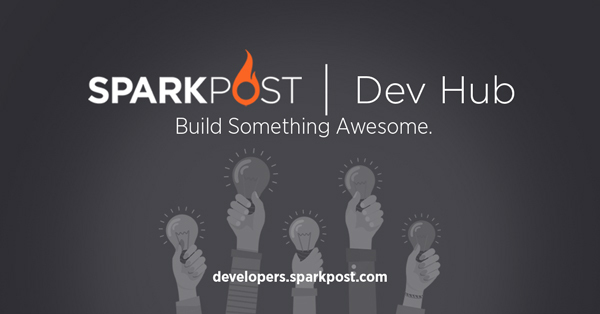 The SparkPost Developer Hub pulls our developer content together in one place. As we continue to add content from the community and our engineers we hope this collection of resources empowers you to build something awesome.